Is ‘Empathy’ really that difficult? While Design Thinking (DT) creating a buzz across industries or domains, there is a lot of overwhelming content on popular business magazines like Forbes, HBR, FastCo. etc. reinforcing its importance in businesses. However, there is one common element which everyone wants to stress in Design Thinking is ‘Human Centricity’ or ‘User Centricity’ or a more conclusivily ‘User EMPATHY’. This excites me to write on this topic that whether ‘Empathy’ as an emotion or as an act, really that difficult to inherent Design Led Innovation? To begin with I tried to build up a scale on Human Emotions + Attitude (Emotitude*) with a scenario around a person who is trying to interact or approach another person. By ‘interaction’ I mean ‘Talking - setting up a conversation’ or ‘Observing - looking at other’s activities’ or ‘Immersing – participating in his/her activities’. Please note* - This scale is fixed up on a broader emotions along with commonly known acts/attitude which one use in daily lives. Emotitude scale ranges from a “Don’t bother me” attitude i.e. ‘Ignorant’ emotion to almost feeling helpless for someone (like crying) which could be showing up extreme ‘Sympathy’. As one progresses from being ‘Ignorant’ towards ‘Sympathy’ there is some transition that takes place from being ‘Rational’ to getting ‘Involved in deeper care’. This transition might be extensive with further varied layers, however, I feel this is where ‘Empathy’ lies or takes place broadly. ‘Empathy’ might roughly start from “I understand you” and spread across to a more involved or an immersive emotion of “I can completely imagine your situation”. During this transition one person is trying to rationalise the other person’s situation and at the same time trying to get involved in his/her emotions to ‘Imagine’ or ‘Immerse’. 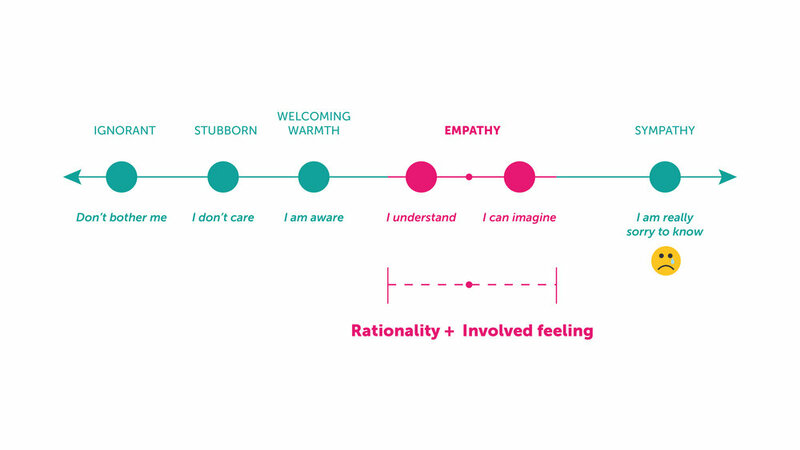 To elaborate this thought, I will further share some regular stories of User research on how ‘Empathy’ played a role from understanding a person to initiate imagination in his / her situation. Background – While carrying out a home visit, I was interacting with a lady who was obstinate in answering my questions. She remained inconspicuous throughout the conversation. Though it was a paid recruitment, she was unable to talk and she only had objective answers. Eventually, I was loosing my patience and had no hopes to get any fruitful insights from this visit. One thing I realised, that she was unwilling to allow me to enter her kitchen for my study purpose. I somehow got inside and looked around to dig into the scene of her cluttered and messed up kitchen, to know why she was suspiciously reluctant. Here, I tried to put myself in her situation and started imagining why one would have such behaviour. I realised, any woman would have the tendency to hide a messy space in her home! And why? Because the tendency is to avoid getting judged on portraying bad picture of a sacrosanct space like kitchen even if the woman is getting paid for it. I guess ‘I was right!’. When I started the conversation around her kitchen, she expressed her concern about the muddle and slightly opened up talking about her experiences. Well, a long story, but few deep dive learning was about user behaviour and how ‘Empathy’ helped to break the barricade of hesitancy. Here, I tried to question ‘Why’ to a obvious behaviour, instead of assuming loosely. The only way to find the answer was to be like the other person (atleast do a short role play in your mind) and then self analyse. Later part was to validate that analysis by probing those questions to the user. Background – Meeting a Quadraplegic Cerebral palacy (Specially abled) girl who was diabetic. To learn how she uses her blood glucose monitoring device on her own. We tried observing her interaction with the product. We also discussed with her Mother about her experince as a care taker. For a long amount of time we were failing to understand that if at all there was any issue with the device. It is tough to do a role play in such case. We eventually, video recorded this meeting for our later analysis. While repeatedly looking at the video we realised that affordance of her thumb to operate few buttons on the screen was problematic to her, which she was unable to communicate. We learnt that not always a ‘role play’ or ‘putting yourself in other person’s shoe’ is going to be helpful. Here, ‘being attentive’ or ‘keen’ towards even minor observations can help ‘Empathise’ with the user. Background – In most of communication design projects, we want to learn from user their perception about colors or symbols associated with the brand and it’s attributes. Such exercises are usually tough to crack. ‘Color’ itself has a lot of individualistic perspective. One person might be in favor of something and the other may have differing opinion. However, colors or visuals are natural catalyst to grow fruitful conversation with the User. As humans we are visually literate species. Human eye reads a word as picture and sound. Our saccadic vision help in scanning words, recognise them as pictures and immediately trigger its meaning to our brain. And all this happens in fraction of a second. Therefore, the challenge here is to learn what is triggering recognition in the User’s mind. A set of colors or cards or symbols can help in decoding User’s imagination as User’s tend to talk more what they recognize. Trick here is to study the pattern of comments made against choices and not the pattern of preferences. The spectrum of ‘Empathy’ scale itself, has many shades of emotions and attitude one can use towards the User to understand him/her better. Yet, it is a natural asset to everyone of us to simply empathise and learn from the obvious. Going back to my question “Is Empathy really difficult?” Well, my answer will be it is NOT! But it is Challenging, Demanding and Immersive! Almost like scanning one hundred thousand nuerons sitting inside human neuro system. One has to be extensively passionate to deep dive in the User’s world to really empathise and learn his/her latent needs or wants. People or organizations who are eager to weave in Design Thinking must learn ‘To Empathise” with their User or collaborate with people who are already fanatical about this subject. Please note* - Emotitude scale is completely based on author’s personal hypothesis and may not have a scientific / psychological relevance. KRANTI VANJARI is a Manager & Subject Expert of Strategy & Design Research at Elephant. She has a graduate diploma in Mechanical Engineering, WCE and a Post Graduate Diploma in Strategic Design for Business, MIT Institute of Design, Pune, India. As they say, the search continues, yet the journey stemming from an inspiration has yielded results. Hartmut Esslinger1 caught my imagination during NID2 days, way back in mid 1980's. As students, we would spend hours at NID's Resource Center (library), reading rare periodicals like DESIGN, ID and FORM. These magazines were our windows to Design in the western world (remember, there was no Google, those days). Esslinger & his firm, FROG, represented the epitome of design flow. He was enigmatic and the work being done by frog was an inspiration. Young FROG, a student initiative by FROG was to be ogled & drooled over, and the little haiku3 quotes were the seeds for our day to day philosophy & debates. As students, we would wait for the next periodical to arrive with the latest FROG creation. We dreamt of designing Skate Boots, Computer Work Station’s, Walkman's, all fired up by the 6 month old news provided by the “customs approved , imported & late arrival edition” of ID, Design or FORM magazine. Stepping out of NID, armed with a graduate diploma in Industrial Design, I quickly discovered that there were no Skate Boots to design. There were no Macintoshes or Walkman's in India. India presented a different opportunity to look at design, playing to an unexplored field of functional needs of a developing nation. We had basic concerns about water, energy, health , hygiene, productivity that needed attention. Design business had to survive in a fledging economy by proving itself. The “Esslinger dream”quickly became an enigmatic inspiration of what an ugly Elephant4 could transform into one day. 27 years later, I was recently invited to speak at International Design Congress, 2015, at Gwangju, Korea. I scanned the list of key speakers and found Dr. Hartmut Esslinger, founder, FROG5 was speaking on day 2. This got me super excited. Listening to Esslinger was the closest, I would come to my Esslinger dream as a student. I grabbed my 2kg copy of Esslinger's latest book Design Forwardand lugged it all the way to Gwangju. The thought of listening to Esslinger live, getting my copy of his book autographed sentKimchi6 textured goose bumps all over me. I even included a quote by Esslinger in my talk at the conference. Dr. Esslinger never arrived. No one explained. I re-read a few lines from his book after two days of carrying his book in my back pack and set it down into my luggage for its journey back to India. May be, I thought, the journey is still incomplete. It began 30 years ago as an inspiring dream, morphed into co-founding anElephant4. Till today, the search continues for the missing Esslinger. the sound waves & ripples might lead our Elephant to find the Frog. What are common people’s right to better design when it comes to Public Services, spaces and amenities? How can common Indian’s benefit from traditional geography based assets? Is there a way of creating a favorable environment to bring design to masses ? India is the second most populous country with the fourth largest spending power. After the slump of 2012, India saw a surprising 7.17% YOY GDP growth in 2014 and is expected to marginally improve to 7.46% for 2015. The Indian stock market recovered much quicker since the US financial meltdown and continues to be up despite the Eurozone Greek crisis. One sees the Indian industry rallying to come up with new innovative products and services ranging from baked potato chips to a service to transfer money using virtual currency on a mobile phone targeted to the fast growing middleclass. NASSCOM says, there are 3100 start up’s in India and as the third largest base, we are adding 800+ new businesses annually. The marketers have no problem understanding the rich and the middle-class of India and designing products for them. What we don’t see is many innovations catering to the people at the bottom of the pyramid. The question! Is there is a role for design to improve life standards of lower two rungs of the economic segments in India. India has demonstrated a huge potential for growth. Yet, what good is growth if it does not take into consideration the aspirations and needs of the common people of India. We can achieve all this by fulfilling the dreams of people.After over a decade of rapid economic growth in India, the biggest challenge facing policymakers at both central and state levels is to ensure 'inclusive growth’ so that the gains from increased national income are shared by all sections of society. In particular, it is imperative that a high quality of basic services such as health and education be provided to all citizens, and encourage ‘local’ development of traditional assets , since these are not only ends in themselves, but also play a critical role in enhancing individual capabilities to participate fully in the growth of the economy. There is a strong necessity to create a frame work to reach out well designed public services and amenities to common people in all walks of life. Isn’t that a birth right as citizens of India? India must take care of its own, whether rich or poor, whether urban or rural. In a country where investment in Public services runs thin, do we entertain expectations of common people to have a basic standard in experiencing public transportation, health care, education, social and personal amenities, traditional livelihood crafts and products based around Indian geographical indications? Successive governments have always highlighted the need for these reforms but have failed to induce imagination. Limited resources spread over a large mass of land and people, has always been a barrier. The way to overcome these age old hurdles is to create a frame work which allows design innovation to foster in public areas and this can be achieved by creating mindsets, sensitized policy makers, implementers and a plan of action using design thinking as a driver. Design is key to the challenges of public service transformation. And those challenges are daunting. Former government established National Innovation Council, and set the scale of what lies ahead. (Bharat Nirman Innovation Fund was set up to encourage innovations in India. Its nodal agency, the National Innovation Council is presently creating a gram swaraj portal that will link 2.5 lakh panchayats and address core development issues). This has been followed by the Saansad Adharsh Gram Yogana by the present Modi government. Great initiatived coaxing the elected representatives to reach to the common people in model villages but without any reference or framework towards design. Design of efficient & safe low cost homes, homes that can be energised in elctricity underserved areas, toilets, drinking water, accessible healthcare, affordable transportation & retail as part Adarsh Gram’s. The Make in India Program was launched in 2014 with great fan fare but forgot the key prefix ofDesign & Make In India. Another great initiative is Digital India, where our PrimeMinister made a fleeting reference to design. Are these references going to make policy makers & executers working for the government sit up and take a serious look at design? New and revised approaches are needed to be inserted in BOLD within these new initiatives which give impetus to designed approach & thinking,which connect the public into the centre of both policy and action, all this through the conduit of Design. A good example to demonstrate is the reform carried in the core electoral process of choosing local and central governments in India. An electoral process that affects millions and which was plagued by the sheer size of ballot paper printing, booth capturing, huge queue’s, time to results was all made easy through a series of reforms in the process as well as introduction of the electronic voting machines and process. A 12 second delay and a system of checks built into the machine prevent abuse of the electoral process, the electoral effort is just a press of a button, has reduced use of paper and printing, the machines can be reused for years, whole process is faster so less time in a queue for people and by the end of the day the people of India have a result. This is a great example of innovation in public space where design, technology and smart policy thinking all together played a crucial part in creating an efficient workable system for one of world’s largest democracies. Will such “Design for People” examples inspire us to look through design for public transportation, energy, sanitation facilities, roads & walkways, accessible drinking water, accessible & reliable healthcare and livelihood ? Can we achieve a seamless alignment between the Smart Cities program and our Adharsh Gram’s (model villages) ? Design in the public domain will not occur at the flick of a switch. It requires public services to build the capacity to think design. That means supporting public servants and staff to develop some of the skills required; ensuring that they are aware of and able to deploy some of the tools – not least the design tools – which are available such as prototyping, needs based user segmentation or customer insight and journey mapping; building an understanding and appreciation of key disciplines such as service design and growing effective risk management at all levels of the organisation. Bandung, Indonesia hosts a Design Action event which looks at design accupuncture through creative activation. It is focussed action based workshop between 100 odd policy makers & government employees and Designers to re look at prevelent issues surrounding Bandung. Issues which matter to common people, issues which will de congest, improve water, sanitation, lifestyle and safety. Bandung Design Action presents a perfectly scalable model to approach our common people issues in India with design. And people are important – design innovation demands people with a wide range of experience capable of applying that to new settings so the regular recruitment, on whatever basis, of new people and new ideas is critical to success. In the private sector, the GOI & NID’s “Designing Clinic for MSME’s” programme is already proving a powerful route to innovation for many small – and medium-sized businesses by making available design associates to work with industry sectors. There is no reason why that programme could not be translated into the public sector with equal success. This may be translated in action through a design sensitisation program in various GOI ministries, secretariats’, municipal councils & corporations and the Gram Sabha’s. The overarching idea would be to create ‘informed governance’. The establishment of a policy innovation program can act as a stimulus to innovation across various departments and send strong messages that senior administrators and the political leadership become open to new ideas. The program as this level can be made mandatory course material in Public Administration service colleges and institutions. This can be followed by a Design audit program which would evaluate the functioning of various public services and prepare a road map towards improvement. This road map can be put in a design action program through active participation between various design professionals and public service stake holders. A good example here is the Ahmedabad BRTS for public transport. Compared to say the the first BRTS in India, Pune, an examplry failure program (2006-2008) , which was closed down after a few mishaps, the revamped BRTS in Pune has has still not been revived in 2015. The difference between the two programs lies majorly in the approach through design thinking apart from political will. Pune Bus Day, India, was a public event to highlight the apathy of public transportation in Pune through a Design led event & public participation. Whether we examine present public services & spaces or traditional assets, any co create , co develop program will require a serious amount of buy in from local communities. Without buy in and participation by the intended beneficiaries, the entire design effort will be a waste being a one sided exercise. Developing champions within local communities and creating design leadership at people level is crucial to the success of any design intervention program. Sensitizing local leadership towards design thinking and making them program managers for such initiatives may be one way of creating community acceptance. Focus must always remain on tangible and direct benefits to the communities in question and this can be reinforced through rhetoric and actions of such Community Design Leaders. Laxmi Murthi, Designer, founder of Uger, a social enterprise was concerned about hygiene and affordability issues with synthetic sanitary pads in socio-economic backward populations in India. Uger has designed sanitary pads for women that are made entirely in cotton. They can be washed as per usual home processes and hence can be reused. This makes use of sanitary pads affordable to low income group women. This in turn improves hygiene amongst these women. The pads come in pleasant colours and patterns. The inner stuffing is cotton, which does not add to disposal and landfill issues. Pad making has given employment and work to women from the region. Projects like those undertaken by Uger demonstrate that design can address multiple issues for common people. The expectations of the public are rising and they would sooner than later expect more intelligent services that are responsive to their personal, family needs and circumstances. The evolution of Indian Posts in terms of their services and Indian Railways from making train tracking, scheduling and ticket booking a pleasure is a great example of Public service improvements through smart thinking. Setting up of a design lab with NID is a step closer to bring design to common commuters (2014 Rail budget and following action). Getting people to participate in the improvement of services will be a big step to include those “ little but crucial suggestions” into any improvement plan. Think what can happen with well thought out public health care systems, a system of well thought hospitals, clinics and outreach programs all designed with people and for people. The implications are gigantic for a country like India. We are revising the future of India. Barriers blocking Design in public space. How do we overcome ? Acceptance of failures in public area is always problematic and any new design thought led innovative public service effort is fraught with failures and is intrinsic to the process itself. Rapidly absorbing lessons from prototypes & pilots, the experiences of early implementers and emerging research findings, and making this accessible to the sector. This means a different approach focusing not just on what works now, or has worked in the past, but what will work in the future. This thinking needs to be reinforced to both traditional products as well as public services. An as a process new Public services can promote design thinking through heavy reliance on improvement spread and top-down dissemination (for example creating national guidance and toolkits that can be distributed through focused programs managed by the India Design Council). “ But simply exhorting everyone to copy the latest bright ideas – imitation as innovation – ignores the fact that every local area has different needs.” This is especially true when dealing with traditional crafts, products and processes. “Sometimes innovation is about making old ideas work – or combining them in unusual ways – not coming up with endless new initiatives or continuously seeking the next “big idea. In public services, it may be that we need a concept of reinnovation (reapplying existing ideas in new ways in different places), as well as innovation (the first use of a new idea)”, says, Julie Jones, CE, Social Care Institute for Excellence. This calls for creation of a Public Services by Design initiative, which would offer a template by publishing a ‘rough guide’ to organising such activities, which would translate the rhetoric of policy into the reality of better outcomes for people. This can be followed up by a series of specialist briefings for different target groups within the identified sectors by collaborators from design and other fields outside the sectors. In the private sector, the pressure to achieve profitability & competitive advantage provides its own incentives, but these are not as strong in the public services. Organisational leaders need therefore to compensate for this deficit via systems and their own behaviour. But we also need to become better at designing incentive regimes which do not merely reward the highest performers but recognise successful Design innovation or design improvement wherever it is found. This also helps highlight efforts where public services and traditional asset design incubation programs are highlighted for others to benchmark and be inspired. Several new avenues for improvement, new stories of efforts will be thrown up in the years to come. Several champions for design leadership in people space will be created. A national network which helps connect design champions, communities, professionals, administrators, NGO’s with each other to share and learn can be the new “Design Innovation” temple of tomorrow. Like China. South Korea, Thailand, Singapore, Spain , UK and many more countries, India must build destination centers that celebrate design & innovation effort, provide platform for people, craft & industry & policy makers to understand need, process & application of design. Contribution to a national design data that feeds research and acting as aggregators for various centers of excellence that can reach design to common, can be objectives of such centers. As a corollary to the design process it may be prudent to prototype or pilot the overall thought for making design reach out to the common people. Strongly articulated political will, design sensitised policy makers and program approaches will incentivise designers in India to look at design in Public service and one that will affect the life of common people. Design is meant to improve life and the profession will make sense only when it uplifts the life of a sizeable majority in India. ASHISH DESHPANDE is an Industrial Designer, Co-founder & Director at Elephant. An alumnus of National Institute of Design, Ahmedabad, he is a keen Design Thinker, a member of India Design Council & Jury for India Design Mark. He has worked on several design programs, ranging from energy saver appliances, healthcare products, dairy process machinery and energy products amongst others.